Streetwise Security Products continues to lead the industry with compact, lightweight self-defense products. 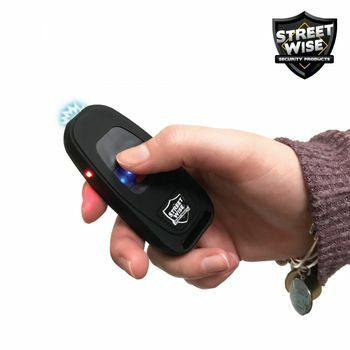 Our latest, innovative design Streetwise Key Fob 24 Million Volt Stun Gun looks just like a real key fob, giving you the element of surprise. Although this unit does not function as a key FOB, you are the only one who will know that. When attached to your keychain the bad guys will have no idea what you are packin' until it is too late! 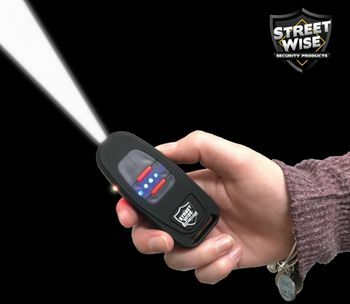 The Key FOB stun gun has a built-in light for nighttime safety. The light stays on until you press the button to turn it off, so you don't have to keep holding it if you want continual illumination. Unlike most stun guns on the market today, the stun can be used while the light is on. This can save you valuable time when you need to quickly defend yourself. If someone still approaches the built-in stun gun makes an intimidating sound when activated that causes most would-be attackers to “think twice". An attacker with any sense will be stopped in his tracks. If the light and sound don't stop him, a jolt from the Key FOB certainly will. Simple operation, compact size, discrete design, and a mighty stun make the Key FOB Stun Gun is the obvious choice for those who want the next generation key chain stun gun!